My "office" during the recent Day Out with Thomas event at the Valley RR - GE 80 ton center cab diesel. Still training - hope to earn my engineer qualification soon. Every once in a while, it's good to step back and take stock of the progress you've made. This is especially true if you start to feel overwhelmed by the task at hand and your motivation starts to lag. It's true in life (whether you're talking about diet, exercise, or some other goal) and it's true in building a model railroad. So please indulge me as I post here the progress I made during the month of April. These were all items that had been put on the punch list as a result of a couple of "shake-down" ops sessions in March - and some of them have already been detailed in earlier posts. But as I stare down the projects on the horizon, and start to get that all-too-familiar anxiety, I thought it'd be good to document how far I've already come. Besides, having a record of what all I've done to model CT Valley railroad operations in the post-war era is one of the main points of having this here blog. So, without further ado . . .
My second heaviest lift - installing the mainline crossover that will allow trains to get from New Haven staging to eastbound Track 2 before entering the Saybrook scene, per prototype. No more wrong-way running! And the Air Line - which had to be removed for construction of said crossover - is now replaced and re-wired. Whether or not you think you're accomplishing very much, be sure to look in the rear-view mirror occasionally. You may discover that you've actually come much, MUCH farther than you think! Apparently, something afoot on the east leg of the Saybrook Wye, seen this morning during my morning coffee at Ashlawn Farm (right next to the Old Saybrook station). I heard the boxcar had derailed, but it must've been rerailed by the time I got there since it looked fine. Later in the day I heard Shoreline East service between Saybrook and New London was suspended "due to a freight train derailment." Couldn't imagine this was what they were talking about though. Just another day On the Valley Line . . .
One of the best things about meets - whether sponsored by the NMRA or the NERPM - are the clinics. The variety of how-to, hands-on demonstrations of different modeling skills by experts in the hobby is always worth the price of admission. But just as important, I think, are the presentations. These won't necessarily teach you a new skill, but they're always informative. Either way - clinic or presentation - if done right, you'll leave knowing more than you did when you walked in. I have the honor of giving a presentation on my layout at a couple of up-coming events. The first is this Saturday in front of the NMRA's Metro-North Division. That'll be something of a dress rehearsal for giving it at the NERPM meet in Enfield on June 3. I've been working on putting all the material together (which is one explanation for why layout progress - and blog postings - have slowed a bit), but I'm excited to be able to share a higher-level overview of what I'm trying to accomplish. It'll be a bit of a contrast to the deeper weeds I tend to get into here. 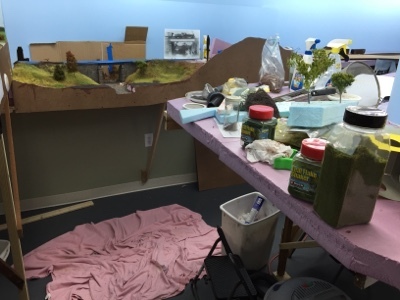 It'll be more of a "presentation" rather than a "clinic" - but I hope folks will be inspired by what they see and will try modeling a prototype railroad. It's one of the best ways to create a time machine that I know of. Well, I've finally converted the 3rd - and last - of my throttles from whippy antenna to internal antenna/wire. For a detailed step-by-step of how I did this on my NCE ProCab (heh - my first attempt. #nervy), click here. I generally followed those same steps to modify my utility throttles (NCE Cab04pr), but I found these conversions a bit more difficult a) because everything's so much more cramped, and 2) I've actually gotten worse at desoldering (I had a devil of a time removing that last antenna boss). LOVE workbench photos - they're so motivating. Especially when they're of YOUR workbench! The shot above is how things generally look during one of these mods: Cab opened up, soldering stuff at the ready, assorted parts standing by. . .
Solder a wire to the center antenna trace. 20 gauge wire fits better than 18 gauge in these small throttles. I forgot to measure the length, but you need it to be at least long enough to turn to the outer edge of the case and go down the side. Widen the slots on the tabs on the side so you can tuck the wire down into them. Cut the red battery wire and solder the toggle in line on the red wire (i.e. solder the ends of the red wire to the pins on the bottom of the toggle. Ok, that was not so "briefly" - but now you're done! Put everything back together. The toggle located between the screw boss and the LED, with the pins toward the screw boss. Pro Tip: add an eyelet and lanyard to the bottom as above so your operators can operate hands free! And here's what it looks like when it's all done. MUCH nicer without that long, unwieldy antenna, dontcha think? New Haven J-2 class 2-8-2 resting at Somerset, CT on the Air Line. Model by Ted Culotta's dad - looks amazing but weighs so much I'm afraid it'll sink into the foam . . .
During my recent construction push, I decided to swap out one of my MicroMark switch machines for a Tortoise. I needed the MicroMarkMachine somewhere else, and I had the Tortoise on-hand. There was only one problem: There was a feeder wire coming down Right Where the Tortoise machine would have to be located. The machine couldn't be turned 180 since there's a joist in the way; and the feeder wire couldn't be moved since it powers a 2" section of rail between a frog and an insulated joiner. If I had it to do all over again, I'd have extended the rail up to the frog rather than have to power that short bit. But since I didn't feel like ripping out and replacing track, I decided on an alternative - I'd use my handy-dandy Dremel with a router attachment (which I hardly ever use - until now) . . .
Once I decided on this course of action, I got into it pretty quickly - so quickly, in fact, that I forgot to take a pic showing where the wire came down. But it came down where you see the LARGE routed-out section there on the right. And you can see daylight through the hole where the machine's throw rod will go. It was just a matter of routing out a channel to recess the wire so the Tortoise could mount on top of it. Be VERY careful! My particular Dremel only has two speeds - fast and wicked fast - and you want to go as slow as possible, hang on tight, and control it as best you can. I started with the feeder hole and went left. As you can see, I didn't control it very well at first. That thing cuts pretty fast! But the result was worth it - a nice recessed feeder wire and a machine that mounts nice, firm, and evenly on the plywood. Next time though, I'll plan (further) ahead and just eliminate having to power such a short section of rail . . . Sometimes, it seems no matter how long I work on this layout, the construction phase will never be over. It's not that I don't like construction - heh, I've done so much of it for so long that I've actually gotten pretty good at it - but I'm looking forward to it being Really Done so I can focus my time and effort on other things, you know, like modeling and operating. Case in point: Building Backdrops. I've already done a lot of backdrops (and you can see all of my trials, tribuations, and tips here), but now that the past year's expansion has gone through East Haddam down to Essex, it's time to do another backdrop. So without too much ado (since I go into much more detail in my previous backdrop posts), I'll just give you a little annotated slide show of the recent effort. . .
As you may have noticed, unlike the rest of the railroad - with its traditional L-girder/riser construction - the Shailerville/East Haddam to Essex portion of the layout is built on foamboard (read about my "foam foibles" here). Bill promised foamboard construction would get me up-and-running much more quickly - and he's right. But it continues to dawn on me slowly that there are some downsides - like having to retrofit backdrop support into the foam. Using L-girder construction, such support would be a simple matter of screwing a few vertical supports to the sides of the joists. But with foam, I (and by "I," I mean Bill) had to cut a channel into the foam to give the masonite backdrop somewhere to go (and a way for it to get down to and rest on the cross-slats. Fortunately, a buddy loaned me a hot foam knife that I thought would make cutting this slot a quick job. But it was verrrrryyyy slooooooowwww. And just about killed us with fumes. (almost) Literally. Eventually, however, the slot was finished and Bill switched over to a more-familiar tool. As you can see, the fumes from the hot knife hadn't quite worn off yet. This pic also shows what I meant by the masonite resting on the slats. Since the peninsula is longer than 8 feet, I knew a joint between backdrop sections was inevitable. Unlike my previous method of screwing the masonite into a 1x4 backer board, this time I staggered the joints and used construction adhesive to secure them. No screws! and this method ensures as thin a double-sided (masonite) backdrop as possible - ideal when space is at a premium. What you see above is the clamping I used to hold everything still while the adhesive cured. Fortunately, the adhesive itself didn't ooze out and cement the clamp to the backdrop(!). This view is looking "southeast" at Essex. The above view is looking "northeast" at Essex . .
and this is looking "northeast" at Deep River. At the end of the peninsula, considering how tight the radius needed to be, we tried some .060" styrene. In the other room, the end of the backdrop is actually masonite - bent sloooowwwly over the course of about a week, with a sprtiz of water helping the process along the way. Using styrene on the end is much quicker and give you an even tighter radius. You just need to do something about the transition from the masonite. Since the styrene rests "inside" of the masonite, there's quite a step, as you can see above. I could probably have used my handy-dandy combo of fiberglass mesh tape and vinyl spackle - but it would have taken a LOT of spackle, and work, to smooth out this step sufficiently. But I had some vinyl flooring left (from when I had coved some corners before) and figured it was just as useful going around the outside of a corner as coving the inside of a corner. As you can see above, it made quick work of that transition. I just used vinyl baseboard adhesive to glue it in place. Then it was just a matter of using my mesh tape/vinyl spackle combo on the edges to smooth things over. Came out pretty nice. In the photo above, you can see the end of the staging track for the Air Line going above the turnback loop between East Haddam (left side of the aisle) and Deep River (right side). Another piece of masonite - cut for clearance - does an effective job of hiding the staging track. The ends are blended in with - you guessed it - mesh tape and vinyl spackle. I had considered using one 2' high 8' long piece to go around the back of the loop and save me that joint on the right. The top would then have been at the height of the masonite you see on the right. But not only would that approach have been pretty unwieldy, even more important, having it low like this allows me to access the staging track in case there are ever any problems. And if I'd made that track INaccessible, I would certainly have had problems - guaranteed. Once all the screw heads and joints were covered with topping, and sanded, and covered again, and sanded again, it was time for paint. Without boring you with THAT process (nothing innovative here - just get a roller and paint it, twice), you can see the results below. Long view of the aisle between East Haddam (left) and Deep River (right), showing the completed backdrop (Air Line staging shield) in the distance. That end of the aisle will eventually be mostly covered by a wooded hillside. Backdrop behind Shailerville Bridge - behind the backdrop is the northern end of the Air Line, where the track goes from the Mill Hollow module (out of pic to the left) through the wall to Middletown. I'm pretty happy with the fade-in to the wall here. And, finally, the completed peninsula backdrop, showing the tight end and looking at Essex "southeast"
Except for a small section of backdrop that I'd like - eventually - to do behind/above the west end loop on the Shoreline (and maybe, just maybe, a short section on the other side of the wall between Old Saybrook and "New London"/east end staging), I should be done with backdrops for a while. And none too soon - I need to get going on scenery and REALLY want to get some more operating sessions under my belt. So I don't expect much more construction to be done before the tour during the New England/Northeast Railroad Prototype Modeler's meet early next month. If you're at the 'meet, I hope you can make the trip down the river and drop by. I took advantage of the lousy weather and a day off to get a LOT of things done on the layout today. It was a nice full day of finishing the latest backdrop, moving/installing switch machines and a ground throw, and installing a cab bus(!). I'll have posts on all that soon. But at the end of the day, after all the layout work, I decided to do what all this effort is actually for - I ran a train. K-1d #278 needed to head down to the wye in Old Saybrook to be turned and I figured it'd be fun to highball over the Shore Line a bit before turning north and heading back home to Middletown. The video below shows the #278 westbound from New London heading up the east leg of the wye for the first time . . .
and yes, she eventually got all 9 cars up the hill between Shailerville Bridge and Middletown! Had to get quite a head of steam up first, but I was psyched she made it without slipping (too much). 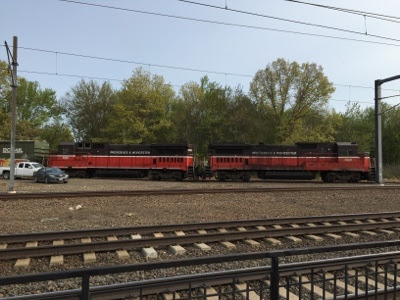 The usual train back north from East Haddam will typically be about half that length - so a nice confirmation that the ol' girl is up for the job. Hope you were able to get some modeling done this Mother's Day Eve! Opening day at the Valley Railroad, and the first Saybrook Special of the 2016 season - northbound at Connolly Drive, 10:35am 5/7/2016. 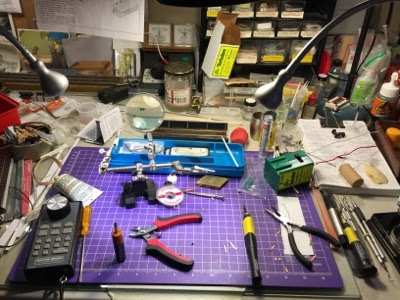 Now that regular legislative session is over (we didn't get a state budget done in time, so we'll be going into special session next week), I have a chance to catch up on my sleep and get a few things done at the ol' workbench to clear my mind - which works best if what you're working on doesn't stress you out . . . but that's another story. I also got the first coat of paint on the Essex/Deep River backdrop, but that's a topic for another post. Suffice it to say that I'll be really really glad when I can finish building this railroad and actually focus on operating it. So - what's on YOUR workbench? A railroad's employee timetable is - not surprisingly - a treasure trove of operating detail. Here are some such notes for the Valley Line . . . List of stations - natch - what does the "D" and "N" mean? 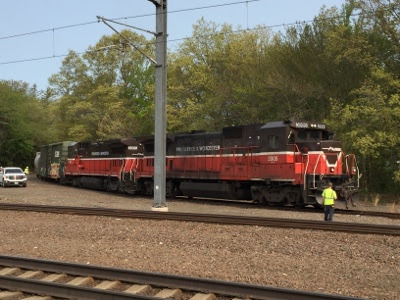 One of the failings of the last ops session was not being able to get a train from "New Haven" (west end staging) to the proper track in Old Saybrook (eastbound, Track 2) without first entering the Saybrook scene and destroying the illusion. We got around the inaccuracy by temporarily adopting the fiction that eastbound trains were "wrong way running" due to some track maintenance. Actually, that really wasn't too far from the truth. But that session made it clear to me that I wouldn't be comfortable adopting this fiction permanently. So I needed to figure out how - somehow - to install a crossover somewhere "west" of the Saybrook scene. The problem is there's precious little real estate available and what there is is just about impossible to access. The photo above shows a mockup of the only location the crossover could go. Behind you and to your right is the turnback loop that has the staging yard coming off of it. That light in the distance - in about an 18" square alcove/cubbyhole - is the opening in the wall where you enter the Saybrook scene. And if that wasn't bad enough, that's the Air Line crossing overhead. The turnout templates are located the only place they can go. The one in the foreground ain't so bad. But how on earth could I install the one in the background? Above is an overhead shot of the tough turnout location. Given what I knew would be a huge challenge, I hemmed and hawed for a while hoping another solution would present itself. Here's a long-shot overview. The little cubbyhole is in the background, the Air Line is overhead, and you can see the turnback curve and the staging yard throat. See my problem? Well, you've probably already guessed that I ultimately decided to bite the bullet and get that crossover installed. But first I had to make the area as accessible as possible. That would require removing the Air Line. Unfortunately, since that section from the module to the drop bridge is all one piece, it all had to come out - drop bridge and all. Closer view - yes, I actually fit in that little hole. Just barely. I'd have to put my arms up through it first and press up using my legs. Sometime I couldn't even use both hands to work, since one arm would be raised up resting on the wall above. Trackwork finally starting. While I use Micro-Engineering track almost exclusively - and am using ME turnouts here - I used Atlas flex for its ease-in-curving. I wanted to make this install as painless as possible and the Atlas flex would take a natural, easemented curve - and it'll be hidden eventually anyway. Siding disconnected so I could install some additional cork roadbed. Everything all done and reconnected. I didn't take many (or really any) photos of installing the problematic turnout since things were already too tight. Couldn't really get a photo. The pic above shows the Air Line reinstalled and the riser put back in. You may be able to make out the fact that I chiseled the corner edge of the riser for clearance. Wasn't totally necessary - 80' passenger cars made it through no problem, but they were a little closer than I wanted. And I wanted to have some margin for the future (in case of a long steam loco cab overhang, for example). The Tough Turnout, all installed. I did my best to avoid kinking the rail - which was a challenge since I needed to install insulated joiners here since the crossover creates a reversing section. Click here for the auto-reverser install underneath this area. And above is the "finished" photo. Compare this to the pic at the beginning of the post. All went according to plan, despite the tight fit. Before reinstalling the Air Line though, I ran all my equipment forwards and backwards at varying speeds through the Tough Turnout to be sure there would be no problems. I certainly don't want to have to get back in there any time soon to do any adjustment - but I think it'll be ok. Heh - it'll have to be. Looking back on it though, there's really no way I wasn't going to do this crossover - eventually. Now my eastbound trains will enter the Saybrook scene on the proper track and that'll go a long way to perpetuating the illusion that the trains are actually coming from "New Haven." And I can check another thing off the punch list . . .
Click to enlarge to see all the new tracks added, especially crossovers. And note how the toggles & turnouts are illogically lettered. As you can see in the photo above, while everything is working, the toggles really have no obvious relation to the turnouts they're controlling. They're associated by letter, but there's no logic at all. And most of the new turnouts don't have any light indicators. Suffice it to say, using the panel during the last operating session was a bit frustrating. So I decided to bite the bullet and make redoing the diagram and rearranging the toggles the top priority on the punch list. Fortunately, BillS could take care of the diagram - I'd have to install the new LEDs and rearrange the toggles myself though. While my now "marked up" panel graphic provided a good indicator of what changes would be necessary, it was also a good idea to draw an accurate schematic of the current track arrangement and get it to Bill. Based on that - and his coming over to visit the track in person(!) - we (and by "we" I mean "he") was able to modify the diagram to reflect the new arrangement. He then sent me a full/true size PDF I could get printed. I took that to Staples and paid the extra for a good quality printer and heavier stock paper. $20 got me a nice new diagram. But I had to remove the old diagram first. First step is to get the LEDs out of the way. A pencil eraser does this easily and safely. The process would have gone quicker if I wasn't trying to preserve the old diagram. But I wanted to save it for posterity (and to have a handy reference for how things "used" to be in case I need it). Bill did an absolutely amazing job of reworking the diagram according to the new arrangement. He also used some prototype diagrams I sent him to make the new graphic as prototypical and as informative as possible. All turnouts are now numbered and - BONUS! - the numbers actually correspond to the toggles and the toggles are all in a logical order. The tracks are also numbered (from top to bottom - 10, 8, 6, 2, 1, 5, 7 - now you know why a diagram is so necessary!). The most impressive thing though was that he measured where my toggles were so that when the diagram was installed the numbers would line up under the toggles (it helped that I'd installed the toggles in a straight line and on 1" centers). He also put little dots where the LEDs should go. Made everything very nice and easy to follow. Once the diagram was in place, I drilled 1/8" pilot holes through the front where the LEDs would go, then drilled 1/4" from the back. Then it was just a matter of installing the little LED "sleeves" that would dress up the edges of the holes, and press fit the bulbs in. I used the same process with the toggles, though the holes were drilled already. So it was just a matter of punching through the paper, pulling the toggle through, and dressing it up with the washer and nut. Once all that was done, I was left with the long and tedious process of moving the toggle wires to connect with the proper turnout wires. In most cases, this just involved disconnecting and reconnecting. But there were a few wires I had to lengthen, and a couple I had to replace entirely. The more involved process was installing the new/additional LEDs and wiring those up. But again, by working slowly and methodically, the process went very smoothly. Just took time. But as you can see, it was certainly worth all the effort. It's really obvious how much better this diagram is compared to the old version. It now accurately reflects the track arrangement and there are LEDs for all the turnouts, and it just looks so much better now, with the main tracks now being parallel and everything being labeled so nicely. The lesson for me here is to not be too afraid of redoing things (within reason, of course). It usually isn't as bad as you fear or take as long as you thought (heh - sometimes it takes even longer, but that's beside the point). In the long run, you'll be much happier - at least I'm finding that I am. Can't wait to try it out for the next ops session - only a few crazy work days left . . .